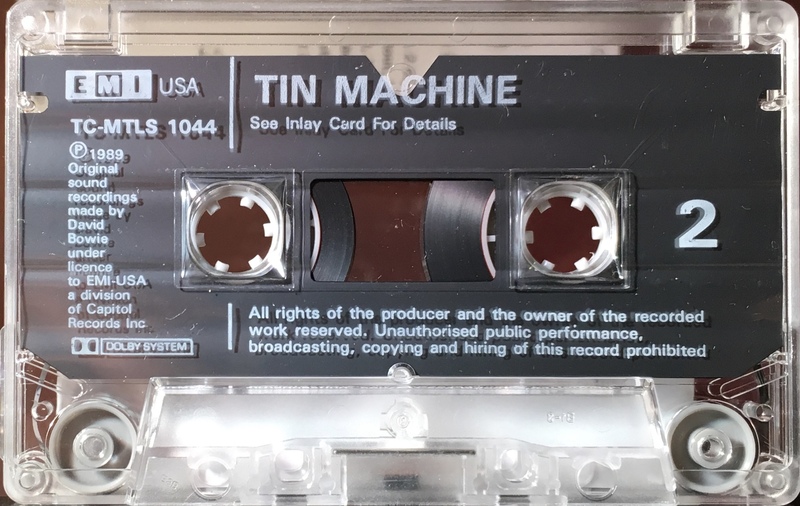 Tin Machine: UK; EMI USA, TCMTLS 1044; 1989. All white panel concertina cover on thick, glossy paper. Cover photo and track list over first two panels with lyrics reproduced over the final three panels on either side of the cover. Track list also on rear panel. 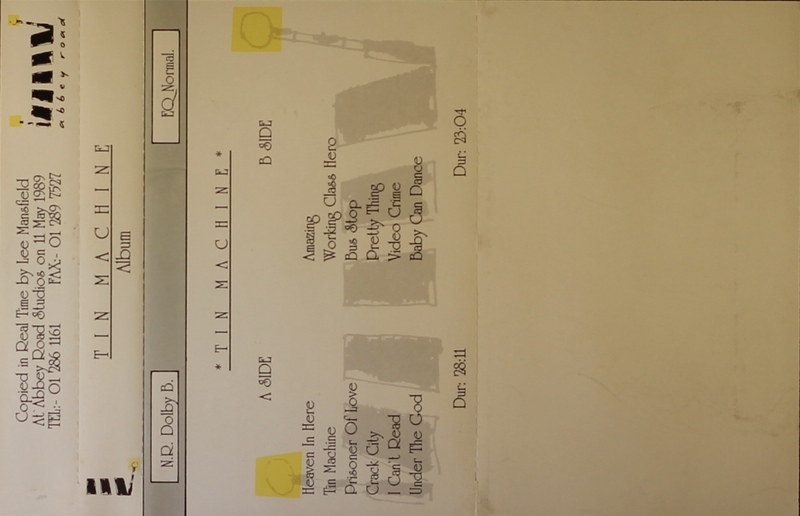 The tracks ‘Run’ and ‘Sacrifice Yourself’ are added to the running order of Side 2 as per the CD. 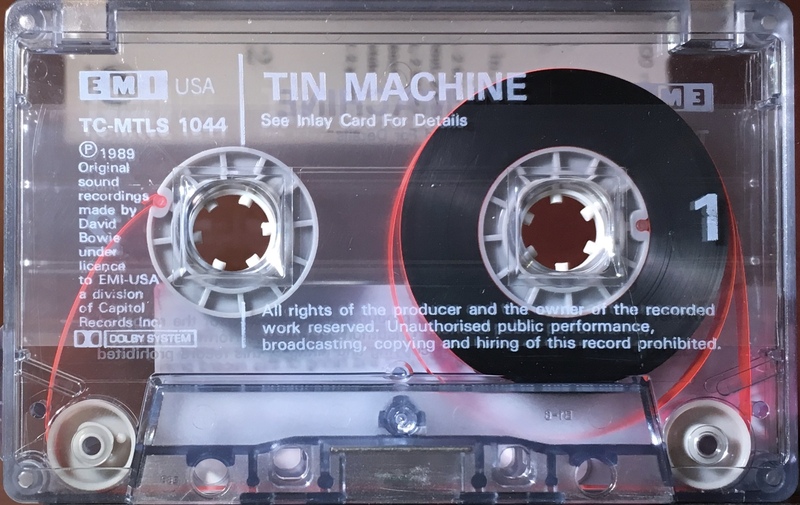 White ink printed directly onto clear shell with shaped slip sheet, shell variants exist: also white ink printed directly onto smoked transparent shell with no slip sheet. 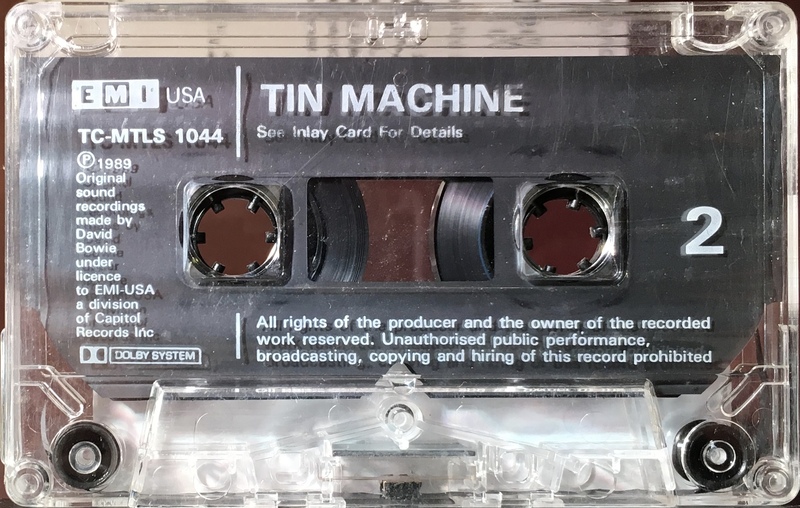 EMI reference tape; no catalogue number – Abbey Road Studios. Mistakes on the title: ‘Heaven In Here’; the tracks ‘Run’ and ‘Sacrifice Yourself’ are not included’. 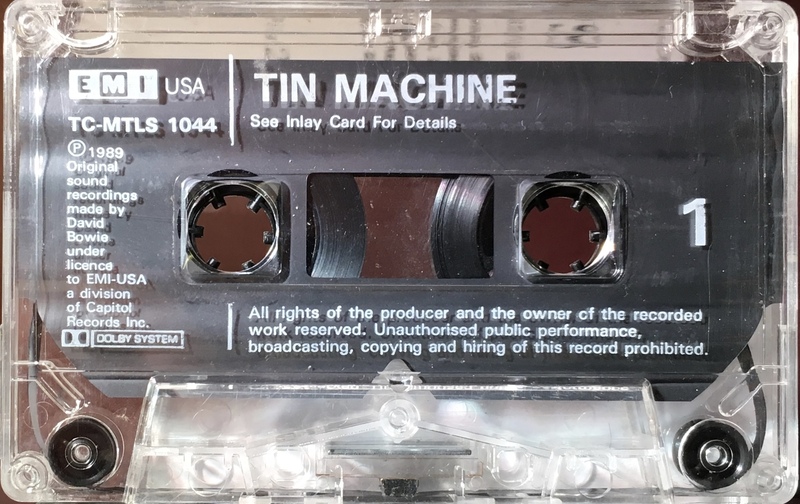 Tapes are produced on That’s FX60. 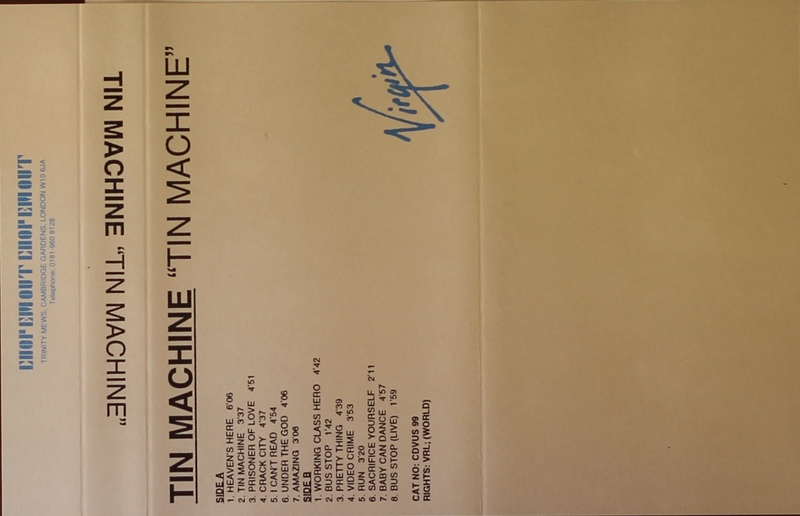 Side 2: Amazing; Working Class Hero; Bus Stop; Pretty Thing; Video Crimes; Baby Can Dance. 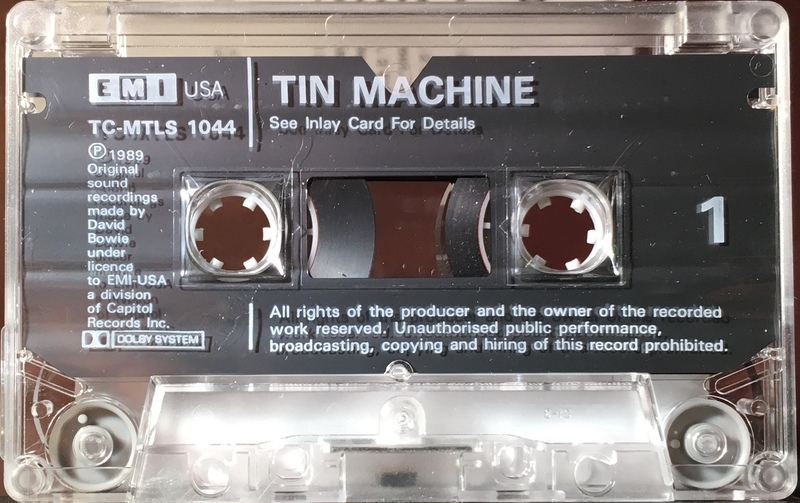 Tin Machine: UK; Virgin; 1995. 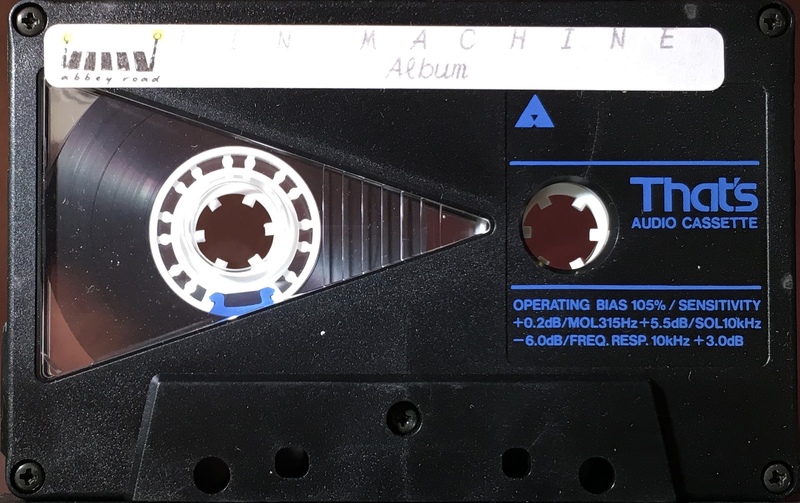 Advance promotional tape for CDVUS 99. Plain untreated paper cover with logo in blue ink. Cat No: CDVUS 99 and VRL (world) rights on cover. 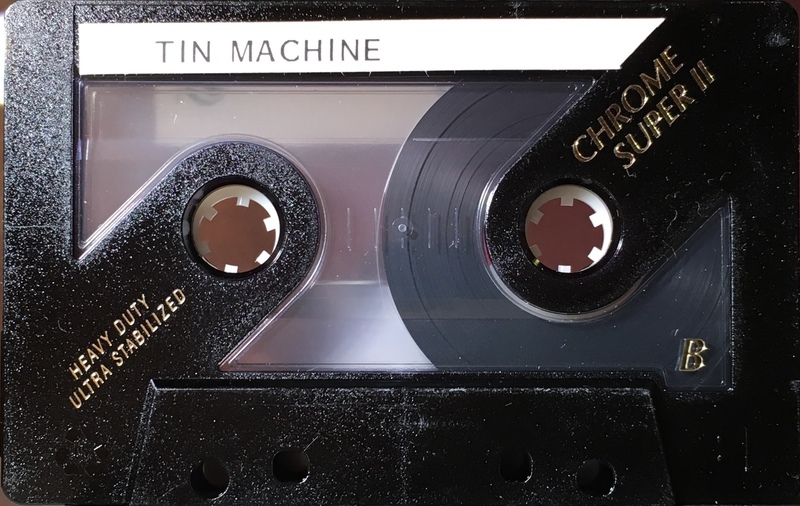 The tape has been mastered by Chop Em Out and their details appear on the rear panel. 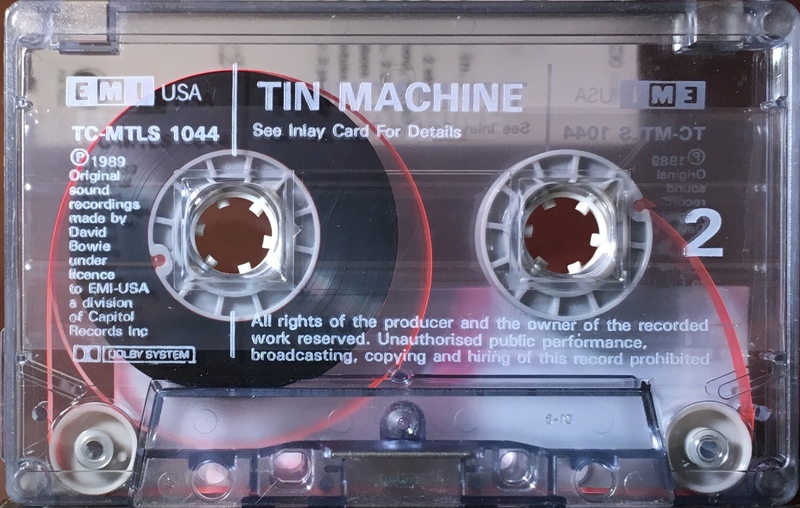 Produced on unmarked BASF Chrome Super II from DAT to correspond with the 1995 Virgin CD release . Includes the bonus track ‘Bus Stop (live)’. Mistakes on the title: ‘Heaven’s Here’; the tracks ‘Run’, ‘Sacrifice Yourself’ and ‘Country Bus Stop (live) are included’. Side 2: Amazing; Working Class Hero; Bus Stop; Pretty Thing; Video Crimes; Run; Sacrifice Yourself; Baby Can Dance; Bus Stop (live).